For the second week in a row, we went to Ward Creek and upstream, but this time the bridge blockades did not hold us back. 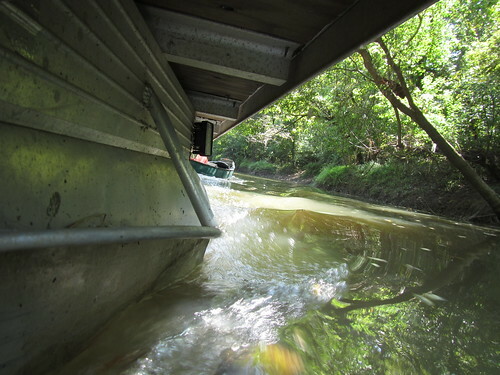 On the last trip down Bayous Fountain and Manchac and up Ward Creek, we attacked several bridge blockages. We cleared quite a bit, but the way was still not open for Jonathan’s pontoon boat to make it all the way up to the Litter Banks of Ward. We had to make a way through before the big cleanup, so we planned another run at it. This time, Jonathan would have a larger chainsaw, and I’d bring all the heavy tackle we use to winch things from the canoes. With our combined forces, we figured we could open it up at least enough to have motorized support for the cleanup. Anything more was lagniappe. Mike and I launched at Drainpipe Launch at Highland Road Park to start heading downstream. 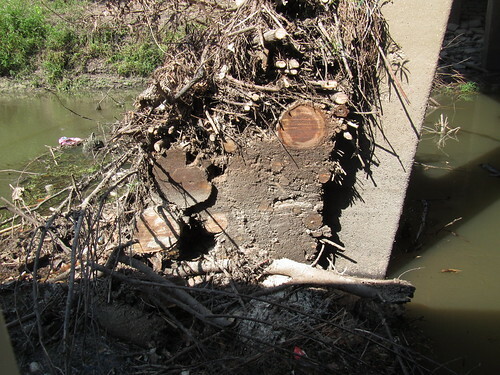 The chain gauge showed six feet and a link below the bottom of the bridge, which is low but not a problem. We didn’t expect to drag on the bottom anywhere — running up on a submerged log is always a possibility at this level, but it shouldn’t be a problem to slide right back off when that happens. (Polarized sunglasses might help, but I don’t want to look *too* cool paddling down the bayou. Might get a big head or something.) With no sustained heavy rains, we didn’t expect to see much in the way of fresh accumulations of logs. 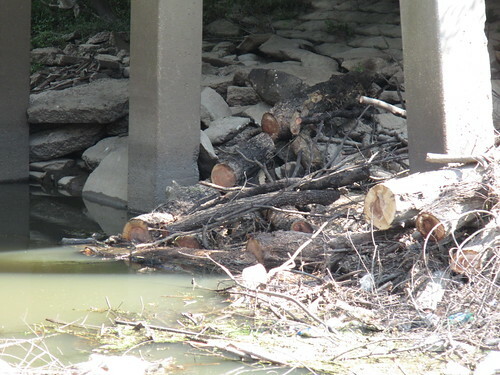 You get a random dispersion of logs when the water’s been low a while, but the small jams don’t generally show up until everything washes down all at once. We hadn’t even gone half a mile when we came across a brand new and rather significant obstruction. 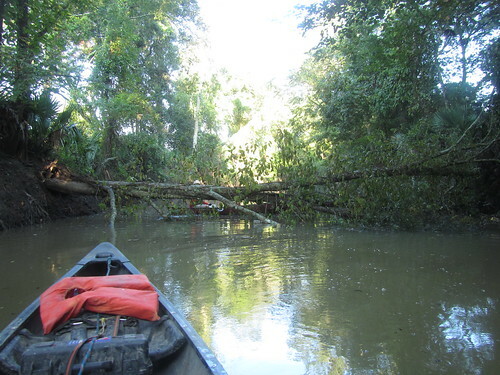 Since last Saturday morning, a tree had fallen completely across the bayou. The water level was actually low enough to slip under it (although sliding under a freshly fallen tree trunk is not my idea of a stable situation), but obviously, it had to go. I slid under and started attacking it from the downstream face, and Mike went at it from upstream. We figured we’d take off all the limbs above each major fork, which would open the bayou enough for now until I get the winch out there to move the trunk end around. Of course, there was one slight complication: The entire thing was *covered* in poison ivy. I don’t mean it had a little vine here or there. I mean that all the green you see except the very far right is 100% poison ivy foliage. The largest vines along the trunk were themselves easily an inch and a half thick! I was covered in multiple layers from shoulders to toes (with my nice hat). Mike wasn’t quite as protected, although he did have sleeves. It wasn’t enough, of course, as I have some rash through my sleeves and Mike got much more. Perhaps I should get an offshore survival suit and perhaps a beekeeper’s headdress to wear when we’re attacking poison ivy *this* prolific, but it’s usually not quite so bad. There was nothing to do but go through it, of course. I did my best to lop off the foliage a bit at a time and let it fall away from me, but once you’ve got the stems and leaves out of the way, there are still the thick vines to cut through. (Don’t inhale *that* sawdust.) 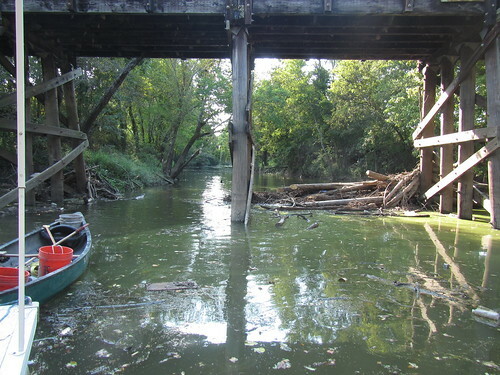 We managed to work through it all and cut off all the major limbs, opening up sufficient room to paddle through. If we get heavy rain, the rest may take care of itself. Otherwise, I’ll be out there to finish the job (and hopefully not collect more urushiol). That one downed tree turned out to be the only significant item of work along Bayou Fountain. It was an easy run the rest of the way, with no bottoming out on the bottom and only a few places where upcoming work will likely be necessary. 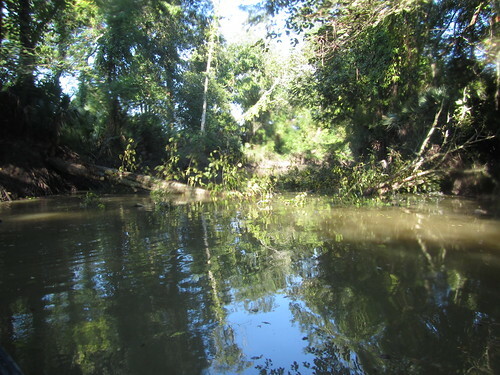 By 10:30am or so, we were on Bayou Manchac heading downstream toward Ward Creek. It was a nice, relaxing paddle with virtually no detectable current. The usual birds were everywhere, and a small alligator briefly made an appearance as we arrived at the railroad bridge. (They disappear only slightly less quickly than turtles.) Soon enough, we met up with Jonathan and his pontoon boat, and after hopping aboard and mooring our canoes to the stern, we were on our way (with significantly less upper body strength required). As we headed up Ward Creek toward the Pecue bridge, we were rather wondering what aromas we may encounter at the work site. 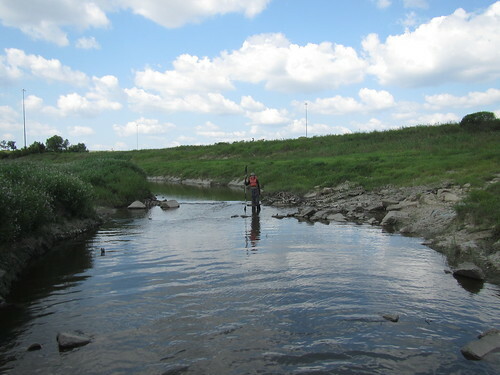 Last week it was the revoltingly sharp scent of insufficiently treated wastewater, which I might note does not significantly improve paddling conditions. I wasn’t quite expecting what it would smell like this time around. Turns out, the water was still entering the bayou, but now it smelled *strongly* of chlorine. It was like being beside an indoor pool. 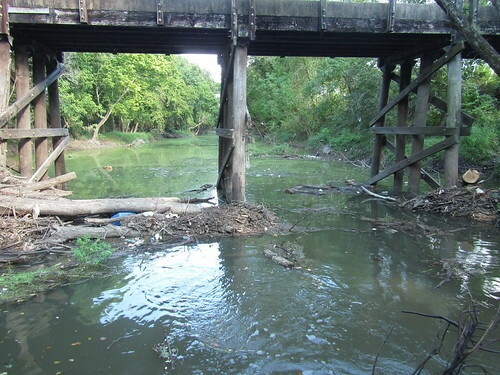 It seems the report from last weekend was received and corrective action taken, and the result made for much improved conditions on the short length of Ward Creek that had been adversely affected. With a much friendlier olfactory environment at hand, we got to work on the Pecue bridge blockade. Jonathan immediately went to work on the taller section of accumulated logs and debris, while I hopped off the boat with all the heavy tackle and started pulling hard on some of the mostly submerged very long logs blocking the southernmost theoretically passable bay. His chainsaw worked quite well at cutting through the large amounts of piled-up debris, and the winch worked wonders on the submerged logs. I have no idea exactly how long the keystone log I was working turned out to be, but it took several pulls with Jonathan cutting off another several feet each time before it was finally a done deal. Eventually, we had two bays mostly clear, with enough room to get the pontoon boat through either one. There’s more work to be done, but that was enough for this bridge on one day. 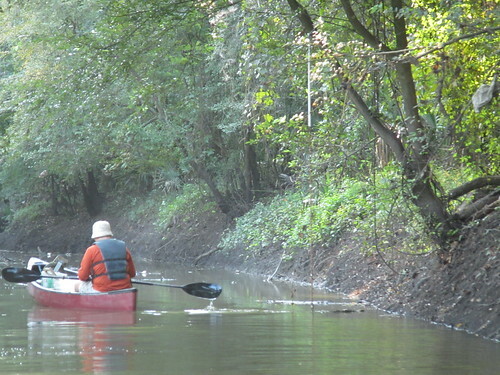 With Pecue passable, we powered on upstream to verify there were no other impassable problems between Pecue and the Litter Banks where the cleanup would be. As expected, the way was open, and we made it to the vicinity of Siegen without incident. Out of curiosity, we decided to continue a bit more and head toward the Mall of Louisiana. I was hoping to see that BREC’s CAPP bridge had suddenly materialized overnight, but apparently the combined magical powers of BREC and all of us bike and pedestrian people still hasn’t quite cracked that nut (although it’s coming), so there was nothing significant to report until we reached the concrete rubble of the equipment crossing in front of the High Grove. As you can see by the fact that I’m standing on the water (and am not divine), Ward Creek is currently impassable at that spot (visible in Google Earth if you look closely). Perhaps some day we could have that addressed, but for now, it’s simply a reasonable place to turn around.